More Than $68 Billion a Year. Talk to any businessperson about the technologists he or she deals with, and you'll likely hear lots of frustration. Talk to any technology person about his or her business colleagues, and you'll hear the exact same sentiment. Business people ("suits") consider technology workers to be oddball misfits who care only about the latest and coolest devices. Technology people ("geeks") think business executives are soulless and only care for the bottom line. But the problem is not that geeks are too focused on technology or suits are too focused on money. It's the profound cultural clash that prevents either group from communicating with, trusting or respecting the other. 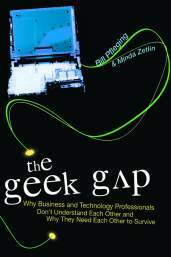 This is the phenomenon Bill Pfleging and Minda Zetlin address in their new book, The Geek Gap: Why Business and Technology Professionals Don't Understand Each Other and Why They Need Each Other to Survive (Prometheus Books). According to the Standish Group, only about a quarter of technology projects in the United States are successful. The rest are behind deadline, over budget, have unsatisfactory results--or never completed at all. These failures cost about $68 billion each year. Add to this figure "shelfware"--projects which are completed but never used because the business has no need of them--and that number rises to around $100 billion. Most of this waste could be avoided if business and technology professionals learned to communicate clearly and work together effectively. Though the Geek Gap affects virtually every organization, Pfleging and Zetlin are the first to name the problem, explain why it occurs, and provide practical advice on what to do about it. Authors of The Geek Gap are the sole owner of the information collected on this Web site. We only gather information we need to serve you better and will not - without your consent, - sell, share, or rent this information to others in ways different from what is disclosed in this statement except in cases where in good faith we believe that the law requires us to do so, it is necessary to protect the authors rights and/or property, or if circumstances necessitate acting to protect the personal safety of staff or of the public. 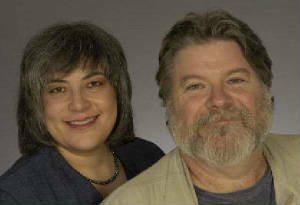 All information on this Web site is copyright 2006 by the authors of The Geek Gap.